With Cushing and PADD 2 continuing to build, the focus has now turned to the Gulf Coast (PADD 3), where builds over October were not negligible at 7.8 mb, according to weekly data, vs our estimate of a 6 mb build. But we are starting to see signs of change. PADD 3 refinery runs should be higher sequentially in both November (+0.1 mb/d m/m) and December (+0.2 mb/d m/m) as autumn maintenance, albeit a lighter-than-usual schedule, comes to an end. In addition, imports have been falling since their 2018 high, which was set in June. Wide WTI-Brent differentials are making US-priced crudes more favourable for those refiners that can add more light sweet to their slates, although with gasoline cracks still weak, incremental uptick will be somewhat limited. But more importantly, imports are getting dearer. Firstly, as we have noted for some time now, the loss of Iranian crudes (even with higher waivers) means higher Middle Eastern OPEC output to compensate for Iran will have to stay in the east. Moreover, the new refineries starting in Asia are all fed by Middle Eastern sours, so this trend will only intensify in 2019. Already, the latest Saudi OSPs to the US for December are sharply higher, by $1.30 on the heavier grades and $1.40 on lights. While a large part of Saudi imports are undoubtedly termed up, this increase in price along with higher freight rates should lower US imports further going forward. Iraq is likely to follow a similar pattern. In fact, the latest data from SOMO for October show a decline in Basrah loadings to the west vs a rise to the east, despite total loadings falling m/m by 2.5%. 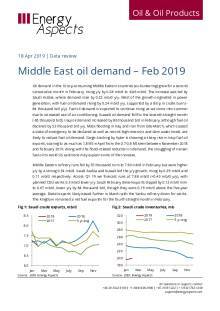 As a result of lower Middle Eastern exports to the west, there are fewer VLCCs available for the backhaul trade, a trend that will only grow in our view. This has made it difficult for some producers to find VLCCs to export, leading to a few cancellations. Even imports from Latin America are likely to be low with Maya pricing extremely high, increasing by more than $4 since the start of October and closing 5 November at almost $10 above WCS at Houston. US gasoline stocks increased by 1.9 mb w/w to 228 mb, with a significant w/w build in PADD 3 of 2.36 mb to finish the week at 82.9 mb (+4.94 y/y). PADD 1 inventories ticked down by 0.16 mb w/w to 64.4 mb, though stock levels are still 12 mb higher y/y. Despite the recent recovery in USEC RBOB differentials, the arbitrage for RBOB along line 1 of the Colonial pipeline was shut, but remained open for CBOB and 87 octane gasoline. The value of line 1 trading space is slightly positive, after hovering around zero for the past month. Gasoline prices remained weak across the US midcontinent, limiting any potential arbitrage opportunities to move gasoline from the USGC to Group Three. As a result, the upward pressure on USGC gasoline stocks will persist, especially as refineries return from maintenance and notwithstanding solid import demand from Mexico. Although US gasoline stocks have drawn by 6.6 mb since 5 October, current US inventories were still 18.5 mb higher y/y. US regular gasoline prices were 19 cents higher y/y at $2.75 per gallon for the week to 11 November.